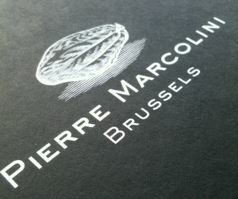 There’s something about Pierre Marcolini that I just love… Something ineffable… something… Nah – I just love to quality of the chocolate! Whether it is the real vanilla seeds in the “tout blanc” or the delicately smooth coffee in the “ganache blanc café” or perhaps the subtle flavours of the “grand cru chuao”, Pierre Marcolini has made Easter posh and delicious and single origin. Pierre Marcolini has created a new series of chocolate eggs this year and while last year it was either a tray of ganache or a tray of praline and that was it, this tray has nine different types of chocolate eggs and some are praline and some are ganache (and some are solid). The box is beautiful. The lid sits snugly down and feels almost like there is a magnet in it. The inside of the box has a second lid securing the eggs inside so they don’t move and yet aren’t fiully reliant on the lid to prevent movement – brilliant. The nine types of egg are clearly labled on an insert so I decided to take them three at a time and taste test them. 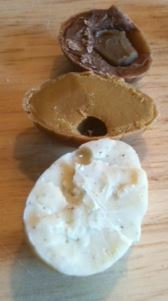 Crème de Nougat, Praline Cannelle & Ganache Blanc Tout Vanille – The delicious chunks of nougat in the egg were just amazing. Not too small yet small enough to work in a small egg, they were satisfyingly perfect. I couldn’t help myself and ate the whole thing at once – it was like a posh Toblerone with utter chocolate and nougat perfection in an Easter egg. You’ll never be able to eat a Toblerone without comparing it to this egg and feeling sad… The cinnamon egg was a surprise to get. I love cinnamon so for me it was extra special but I can imagine someone less of a fan might find it a bit much. It was a slightly crunchy praline with the intense cinnamon that hits you in the nose and doesn’t let go. It was quite the cinnamon hit and given the delicate balance of flavours in other eggs, a bit of a surprise – so you’ve been warned 😉 The white chocolate ganache in the dark chocolate shell made the massive vanilla hit a bit easier to take for me. The white chocolate ganache is soft, so the egg breaks easily, with the dark chocolate shell the perfect counterpoint for the intensely sweet and vanilla ganache filling. Interesting egg I thought I’d dislike and while I liked. 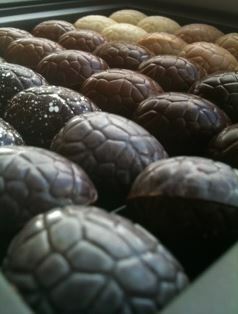 LesGrand Crus – Cuba, Perou & Chuao – These three eggs are what I consider to be the stars of the box. The Cuban chocolate here is fresher and with the cream it brings out the leather and tobacco more than other flavours in the bean. Delightfully dark and yet not biter, the Cuban is a departure for me from my usual acidic red fruits favourites. The Peru chocolate is earthier than the Cuban, with darker notes of red fruits struggling against the intense chocolate flavour. 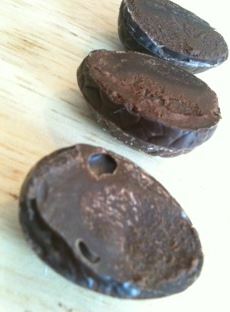 The thin shell breaks easily to reveal the ganache making it easy to eat. 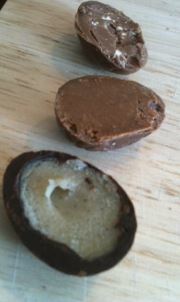 I did, indeed, eat the entire egg as the ganache, while earthier than I usually favour, was delightful. Finally to the Chuao. The red fruit notes were muted by the use of the cream but still there. There was a slight nose of nuttiness but not too much. Absolutely gorgeous! Overall this is the most amazing selection you could possibly get for Easter. Go – now – grab some!